Andrea Jones Soprano; Paul Draper, banjo. “Pork and Beans Rag” (1913), Luckey Roberts. “I’m Just Wild About Harry” (one-step from Shuffle Along, 1921), Eubie Blake. “The Dancing Deacon: Clef Club Fox-Trot” (1915), Frederick M. Bryan. “Jewel of the Big Blue Nile” (song from the Lafayette Theatre production Baby Blues, 1919), Luckey Roberts / Alex C. Rogers. “We’ll Raise the Roof To-Night” (cakewalk, 1904), Sidney L. Perrin. “Chant” from Bandana Sketches (1921), Clarence Cameron White. “Dear Old Southland” (foxtrot from , 1921), J. Turner Layton. “Wall Street ‘Rag'” (descriptive, 1909), Scott Joplin. “Oh Dem Golden Slippers” (minstrel song, 1879), James A. Bland. “In the Baggage Coach Ahead” (ballad, 1896), Gussie L. Davis. “Love Will Find A Way” (song from Shuffle Along, 1921), Sissle & Blake. Overture to My Friend From Kentucky (from the 1913 Lafayette Theatre production), J. Leubrie Hill. 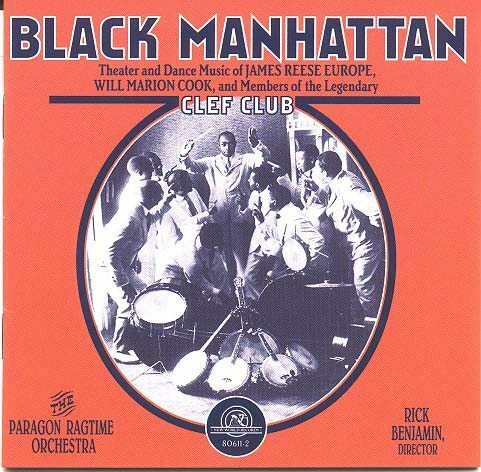 “Royal Garden Blues” (1919), Spencer Williams & Clarence Williams. “The Tremelo Trot” (one-step, 1914), Luckey Roberts. “Just One Word of Consolation” (ballad, 1905), Tom Lemonier. “After You’ve Gone” (one-step, 1918), J. Turner Layton. “Delicioso: Tango Aristocratico” (1914), Will H. Dixon. “The Zoo-Step” (from the Smart Set Co., 1916), Clarence G. Wilson. “The Slow Drag Blues” (1919), Q. Roscoe Snowden arr. William Grant Still. “Ianthia March” (1902), Al. Johns. “I’m Going Home” (Spiritual setting, 1921), Clarence Cameron White. James Weldon Johnson & J. Rosamond Johnson. 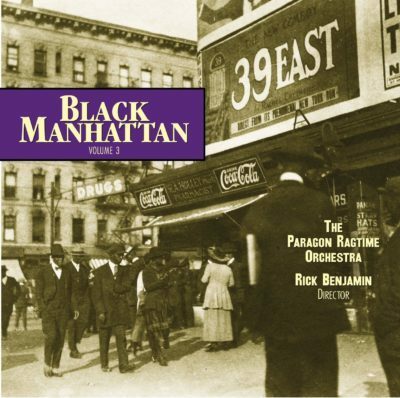 “This is the third volume of Paragon Ragtime Orchestra recordings documenting the music of important African-American composers from late 19th- and early 20th-century New York City. The inspiration for this effort came about twenty-five years ago, when I read James Weldon Johnson’s “Black Manhattan” (1930), a fascinating chronicle of the city’s black artistic life from the Victorian era to the Harlem Renaissance. I came to Johnson’s volume after finishing Eileen Southern’s “The Music of Black Americans” (1971), a wider-ranging academic work, but a no less revealing one. After reading these books I was excited to listen to the music they had described. But there was a problem: remarkably few recordings existed of historic African-American music, and even fewer to represent New York’s pioneering black composers. This inability to actually experience a considerable span of our musical heritage was a void that needed to be filled. Clearly it was time for a carefully curated, new recordings of first-rate performances played from authentic scores.